Due to poor internet, we are unable to upload the redesigned website at this time. It will be uploaded when internet conditions permit. Sorry, online sales only. Proud to be a Michigander? 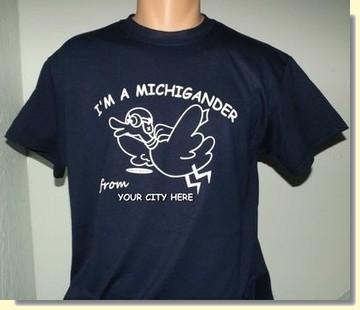 Check out our "I'm a Michigander" T-shirts. Customized with Your City for only $17! We are your online source for everything Onaway. 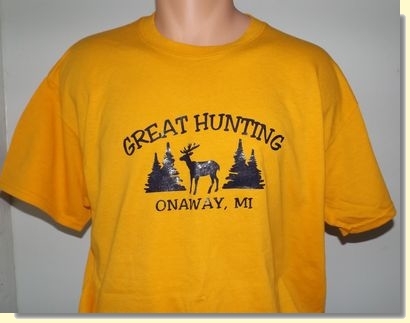 For Michigan "Up North" gifts and souvenirs, featuring mugs, t-shirts and other memorabilia depicting the great hunting, fishing, and scenery surrounding the Onaway-Millersburg area. 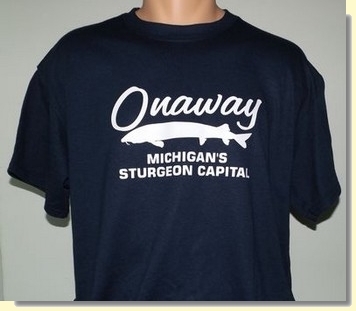 ShopOnaway is also the only source for gifts and souvenirs featuring Ocqueoc Falls, the largest waterfall in the Lower Peninsula. In addition, we offer links to books from local authors as well as crafts from local artisans. Keep checking back for new items. On our Area Businesses page, we are offering advertising to select businesses in the Onaway area. Please patronize these establishments and our local artisans while visiting our quaint & friendly town. Due to space limitations, we only keep a small inventory of items in stock. We will contact you if there will be a delay in shipping. Our vinyl & embroidered items are made locally, so for these items the delay will be minimal. Some T-shirts, and Ball Caps are from local vendors in the Onaway Area. Also, Please support our Great Sponsors while in the Onaway Area. Although, a separate shipping charge for each item will be added to your order at check out, if we can place more than one item in a Flat Rate package and this is less expensive, we will do so and a refund of the overpayment for shipping will be enclosed in your package.